I have no idea how to make this report not long. It was a long race! 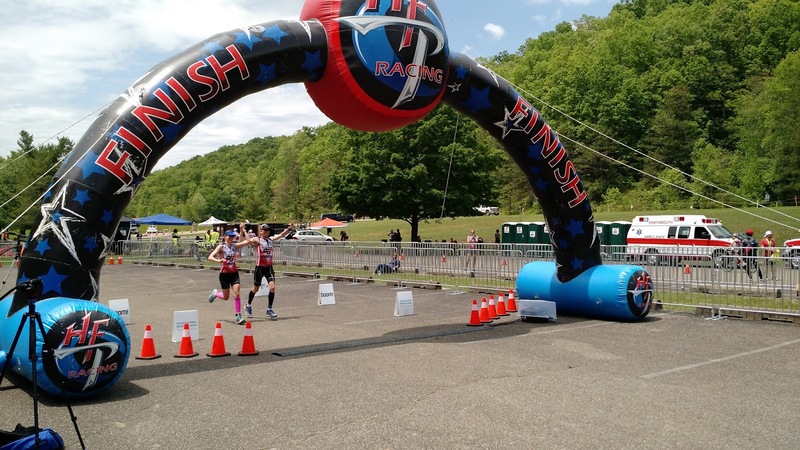 The American Triple-T has been in existence for 14 years and takes place at Shawnee State park in southeast Ohio. 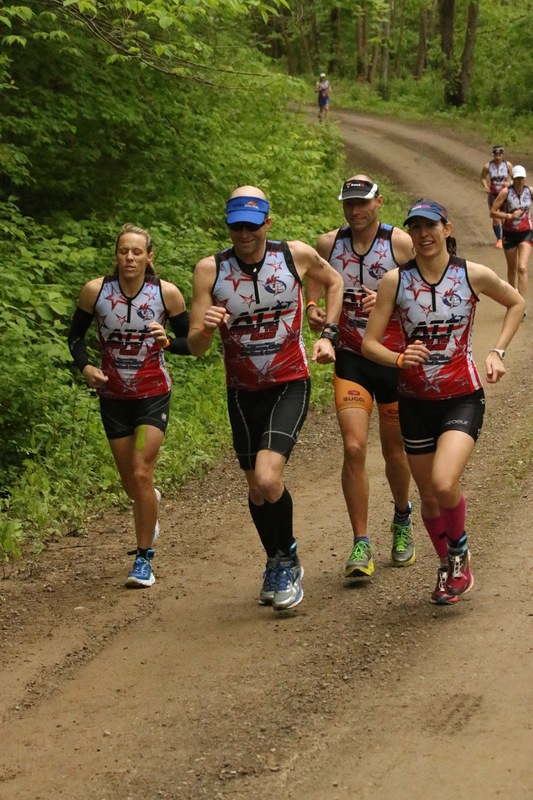 It consists of 4 races: a Super sprint on Friday evening, 2 Olympic distances (sorta - 24 and 27 mile bikes and 6.55 mile runs) on Saturday (7:30am and 3pm) and a half iron distance on Sunday at 7am. The courses are hilly – over 8200 feet of climbing between the 4 races on the bike (over 10,000 feet if you include the runs!). So obviously, the run is also hilly, but on a dirt fire road which is nice on the legs. It’s a 3.27 out and back that you repeat over and over. For Raleigh folks, imagine doing Turkey Creek back and forth for each race. We had a great time. No really, even me, who hates long races, had a great time. But our attitude going in was to just complete the dang thing. NO RACING. Some people told me that this would be hard for me to do but it actually wasn’t at all. Instead, it felt like I was doing a big (really big) training weekend with Marty and friends. When you don’t push the bike on hills, the hills aren’t that bad. When you run 8:30’s – 9:00’s on the run, it’s not that hard. Sure, you get tired, but you aren’t wiped out. 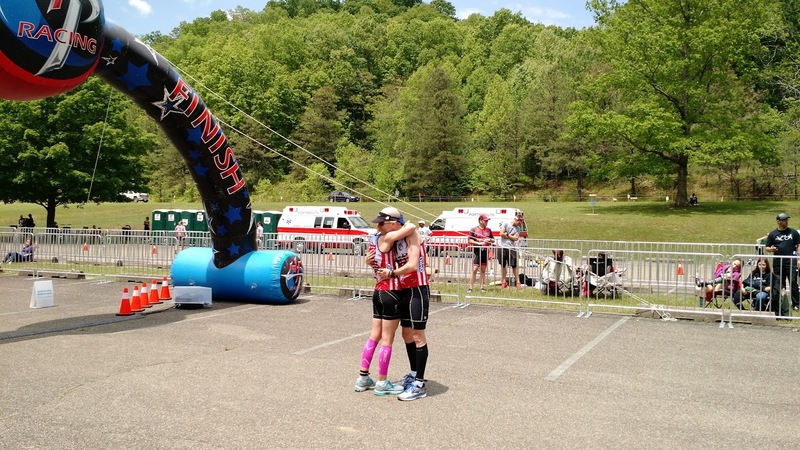 It’s the only way I was going to do this race and for sure the only reason I had a good time doing it. We left Thursday late morning and met up with the Hughston’s in Charleston, WV for the night. The next day was a 2 hour drive to the race site where we checked in and started unloading all of our crap into the cabin we rented at the state park. The cabin was great, except for it being up a large hill that we had to climb after every race to get back home as we couldn’t drive down and park at the race site. I wear my helmet inside because it's just safer that way. The water was cold. 61 degrees – everyone thought it was cold (not just me). I got into warmup because I wanted to make sure I could handle it before just running into the water. I hyperventilated and my face hurt, but I did it. All of the races are rolling starts where you go with 2 other people and the Super sprint people kept to their assigned race numbers to start in order (the next 3 races, not so much – it’s not that big of a deal). The swim on this Super sprint was longer than advertised and when you get close to the exit the temp drops even more which is not awesome. I kept it under control and jogged into transition to do the short bike in the rain. The bike was up the hill to our cabin and back down and then a 1 mile run. I couldn’t believe how hard people were hammering! I didn’t hammer at all. I put it in the easiest gear and just spun up the hill. And then proceeded to run an 8:38 mile. Very comfy. After the race we packed up all of our now soaking wet stuff and road back up the hill to the cabin. 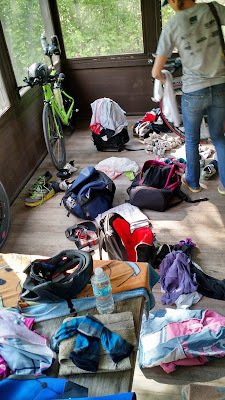 We had brought extra hair dryers to try and dry out our clothes (you have to wear the same Triple-T jersey every race) as well as dry our bike shoes. I had brought two pairs of shorts and running shoes and we had lots of newspaper but everything was just wet all weekend. Marty promised to do the remainder of the races with me and it was awesome. He really is the best! Carrie also went with us and Marty backstroked much of the swim so we could draft off of him. 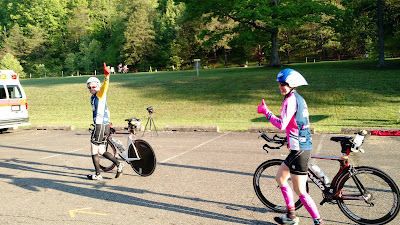 It is very easy to sight off of someone backstroking and I have requested he do this in all of my upcoming races to which I think he said, ‘ah no.’ Oh well. All of the remainder of the swims were slightly short (to no one’s dismay!) -- and then come the transitions. All of our transitions were EGREGIOUSLY slow. Saying we took our time is an enormous understatement. We sat down, we toweled off, we put on lots of clothes, we chatted – none of us were in any sort of hurry. The bike was great! Easy gear the whole way, spinning up the hills, with beautiful country side around us. We kept the run super comfy and it flew by. Lots of talking on this run. Like most of our runs together. If we had to stop and pee, we did. If we had to wait on someone to fix a shoe, we did. We finished with low heart rates and smiles all around. 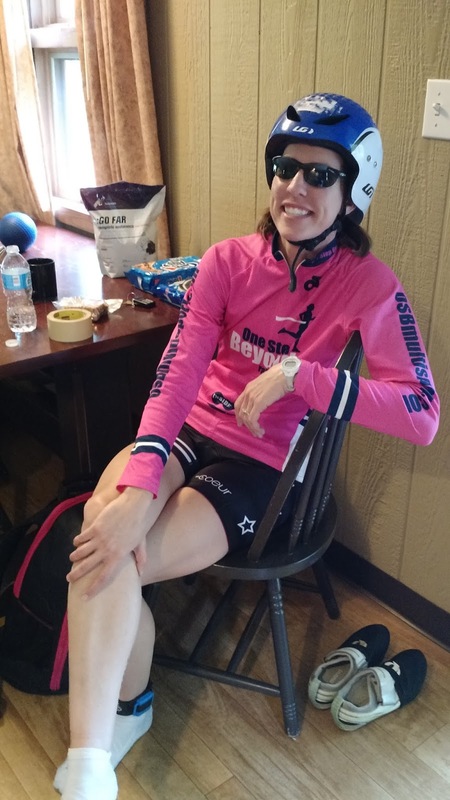 Then we all got massages, rode back up the hill, ate and relaxed until race #3. 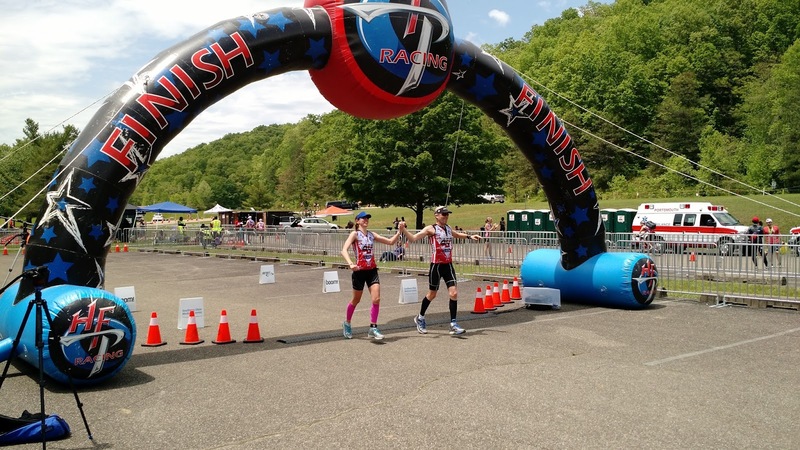 This is a different format – bike, swim, run. Carrie and Whit stayed together the whole time, just a bit behind us so we never actually saw them. We went just a tad bit harder than the morning session on the bike which was a different course and 3 miles longer. There was one nasty grade out there and lots of other rollers. Back in transition (which was 4.5 minutes!! ), we dilly-dallied and waited for Whit and Carrie before we all complained and grumbled about getting back into the freezing cold water (yes, we put on wetsuits, no chance any of us were foregoing those) I sighted off of my backstroking Marty and we exited all discombobulated and dizzy. I have never just walked from a swim exit into transition but I did here. The four of us did the entire run together which was awesome. This was a tough turn around. 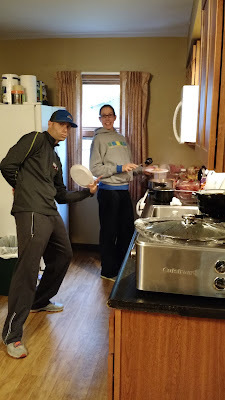 After biking (yet again) up the hill back to our cabin, it was now pushing 7pm but we still needed to eat, unpack, repack, and get all of our crap together for a half iron distance race. 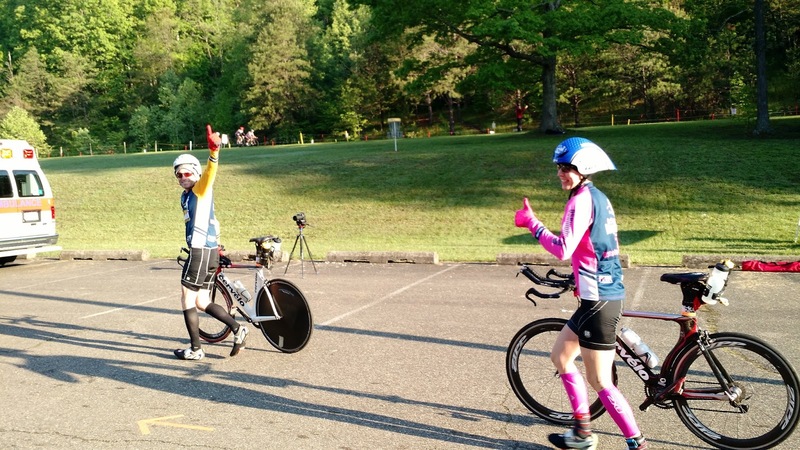 There is also a stand-alone half iron race with ours (the Little Smokey Mountains half iron) so it was a bit more people in transition. The race started at 7am and it was effing cold. And we had to get back in that awful water but first we had to put on our still wet wetsuits. Nobody was happy about this. But I did have Marty right there the entire time, letting me draft and constantly checking to see that I was still right behind him. We strolled out of the water and into transition where we proceeded to take 6 min (6 min!!!) to dry off and put all of our stuff on. Smile now. Freeze in 2 minutes. It was cold. So so cold. We finally got on our bikes and were both moaning and groaning and barely going anywhere as people flew by us. Marty had gotten a bunch of cold lake water in his ear and it was causing him to feel dizzy and out of it. Then we stopped so he could fix his watch. Then we moaned and groaned some more. Then we stopped so we could both pee. I swear, if we kept this up, this bike was going to take us 5 hours! After the second hill we finally got our act together (probably about 30min in) and started to feel human and warmer. The bike was gorgeous! It did have over 4,000 feet of climbing so it was by no means easy. And for the record, on every bike, I really made a big effort to not be on Marty’s wheel (despite us being a team. I’m still burned up a bit about the race organization changing the team rules a few months before the race, but I didn’t come here to cheat). We did have one more stop when one of my bottles filled with nutrition popped off the back of my bike, but when I found it the cap had also come off so no more caloric bottle for me. Luckily, I still had water and tons of food so I knew I would be fine. There was a very long climb at mile 47 which just seemed to go on forever, but then we had a nice downhill finish back into transition. Another long transition. It did include a selfie. Then I ran out a bit ahead of Marty so I could use the port-o-potty. I waited for him to get out of transition and then I needed to fix my shoe. Good thing we are still not in any hurry :) We exited at just over 4 hours and honestly I knew breaking 6 hours was going to be really tough. I know it seems like it shouldn’t be but by this point my legs were fried and I don’t exactly have a great track record of half marathons. And it was hilly – hillier than the other races! How is that even possible. We jogged onward and kept it comfy; a pace I felt like I could hold throughout. We saw Whit and Carrie out there and they looked awesome. We passed 7 people the first lap and I still felt fine. The hills kept getting harder but I was counting down the time (Less than hour! You got this!). The course descends sharply at the out and back portion of the course and I knew that climbing back up that for the last time was going to be tough. I kept at it but very quickly started feeling dizzy and BAD. Marty had gotten a little ahead of me at this point so I shouted to him (and everyone around me) “I have to walk!” I walked to the top of the hill where Marty waited with a caffeinated gel. I incoherently tried to tell him that I didn’t want to take the whole thing without water but he convinced me to take half. I was now jogging again and it kicked in pretty quick and I was feeling much better. It didn’t hurt that we were now going downhill. At the next aid station I got in water and the rest of the gel, and Marty picked up a cup of coke which he held for several minutes because he didn’t want me taking all that at once. So he ran with a cup of coke for me for a while! When he deemed enough time had gone by, he let me drink the coke and soon I was feeling pretty good! The return (and now final) trip back to transition was mostly downhill with just a few little climbs. 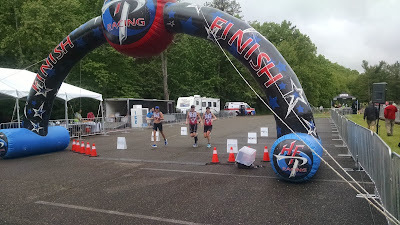 I realized we actually could break 6 hours if we tried to pick the pace up and we ended up running a 7:45 for the last mile which was likely the fastest mile of the 27.2 that we ran (yes, we ran over a marathon combined. Total uncharted territory for me). We finished in 5:58. This race and weekend was A LOT of fun. Made so by the people we went with and my awesome husband who got me through it (with my training plan and literally during the race). A lot of people say that this weekend of races is harder than an Ironman but I can't really comment since I've never done an Ironman. I will say that I wasn't terribly sore the day after, just really, really tired. I think the approach I took makes it not so bad and definitely more enjoyable for me. I imagine if you go out and try to 'race' each race, there is probably a different story here. Portsmouth Brewery with our awesome group. My abs hurt from laughing so much. I enjoyed this report very much. Glad you had such a good time! Hi, My name is Amy Stone. Sorry for the bizarre outreach through a blog comment but I am the host of a podcast called Mile after Mile. 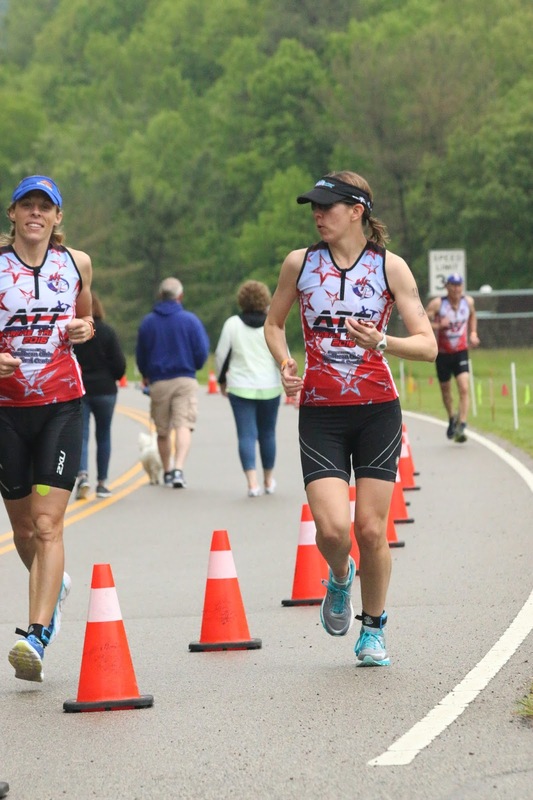 Each week I interview age group athletes in multisport and I would like to interview you about your Triple T experience. Let me know if you're interested. You can reach me at amysaysso@gmail.com You can find the podcast at www.mileaftermilepodcast.com or on iTunes (to check that it's a real thing).